I visiting the training beach at St Kilda with about 20-25 kph winds blowing. I sam my friend Geoff Butcher (also learning kiteboarding) there. I felt a bit rusty getting going. Then I got up and heading left for some distance. Heading back in (right) was still more difficult, but I got in one good run (the first one heading right). Once up, forgetting about the kite and concentrating too much on the board, so the kite crashes out. The kite sometimes scooted back to the right when I was heading left – need to focus on keeping in left quadrant when going left. I again sometimes gathering too much speed again and planing – eventually the board skittered out. Kite “jelly fished” – upside down and back to front (?). Very difficult to water relaunch. When I eventually did the rear and front lines were crossed on each site. Kite could still fly, but this was not ideal. I landed it and re-rigged. I headed quite a way out, then crashed and the harness became unhooked. Holding the bar just put the power on (no depower via harness pulling on front lines) so I let go of the kite. It then blew along the beach faster than I could swim after it. Another kiter helped out by going and jumping on it. I swam to shore (quite a way) then ran along the beach to get it. Lines tangled, kite OK. Carried the kite back along the beach. Overall, a challenging session. Making some progress, but also encountering hurdles. 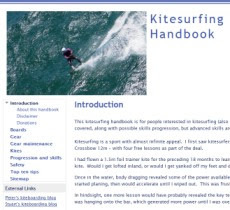 Losing the kite is a real hassle, and relaunching it is not always easy. I noticed some people use retractable board leashes. This is NOT recommended as the leash can yank the board towards you, which can then collide with you. If you use a leash, you MUST use a helmet to be safe. Session 8 – Windy conditions and colliding kites!